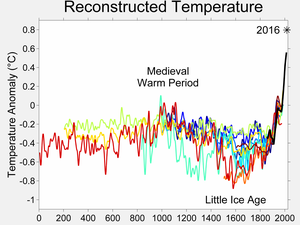 Global warming is a slow and steady rise in Earth's surface temperature. Temperatures today are 0.74 °C (1.33 °F) higher than 150 years ago. Many scientists say that in the next 100–200 years, temperatures might be up to 6 °C (11 °F) higher than they were before the effects of global warming were discovered. Most noticeable changes by this increase in temperature is the melting of ice caps all around the world. Sea level is rising steadily as a result from continental ice melting into the sea. As a prediction, many cities are soon to be partially submerged in the ocean. Consequently, many part of the world have a major increase in temperature. This page was last changed on 25 April 2019, at 17:53.